« What Happens When Tervis Insulated Drinkware Merges with Fiesta Dinnerware? LOOK! 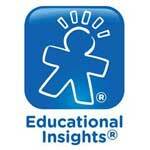 Some educational toys have been around since the dawn of time, and for good reason! I can remember as a young girl playing with the rainbow-colored magnetic letters and numbers on my family's refrigerator as well as on the chalkboard set I had in my room. These magnetic numbers and letters provided an endless supply of entertainment as I learned to spell different words and calculate mathematical equations. Both my husband and I can fondly recall the times we had with this toy and it is something I definitely wanted to pass on to my daughter. So I was thrilled to learn that Educational Insights offers the classic Magnetic AlphaBoard with Colorful Magnets as well as several other alpha/numerical sets of magnets. Keep reading to learn more! I reviewed the Magnetic AlphaBoard with 99 Colorful Magnets from Educational Insights, which retails for $24.99 with FREE SHIPPING. The Magnetic AlphaBoard from Educational Insights helps children build reading and math basics with 99 magnetic letters, numbers and symbols, plus an 11" x 14" practice board. This is definitely a must-have manipulative for promoting early literacy and math and supports activities on alphabet awareness, letter sounds, word building, spelling, number sense, counting, operations and more. The sturdy carrying handle and sturdy plastic frame of the practice board allow kids to take the Magnetic AlphaBoard anywhere, or even hang it up in their room. 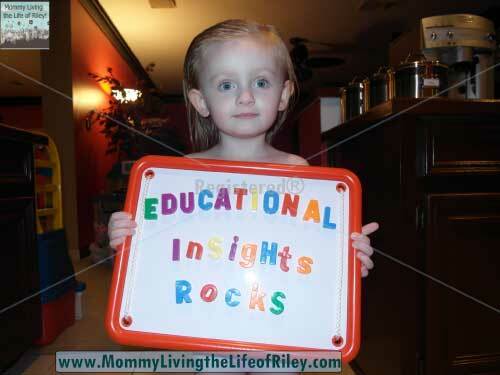 The Magnetic AlphaBoard playset was a complete hit with Riley! She loved trying to put the letters in alphabetic order and mimicking the sound each one of them makes. She has no idea about math yet, but using this learning tool will make it extremely easy to teach her. It's funny to watch her spell right now, for she will put about 15 letters of all kinds on the board and then come up to me and say, "Look, I just spelled Mommy!" That always makes my day! I also love how Educational Insights offers a wide selection of additional letters and numbers to use with the AlphaBoard. For instance, I am very interested in purchasing a larger combo tub of letters and numbers or even a smaller tub of numbers, like the MathMagnets Jumbo Multicolored Magnets. 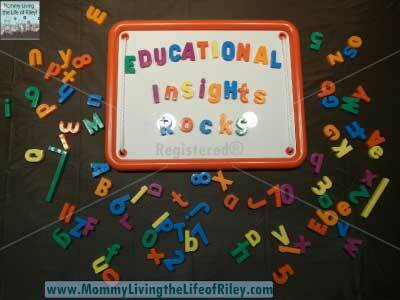 Disclosure: I received the Magnetic AlphaBoard from Educational Insights in order to facilitate my review. No other compensation was received. This product review is based on my own personal experiences with this item and is completely honest and objective.